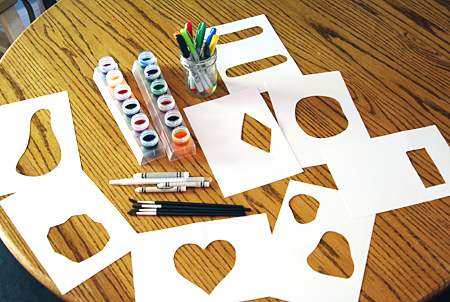 Now that the Christmas crafting and wrapping has been cleaned up, I’m ready to get back to our Friday free play art activities. I like to set-up an art invitation on the kitchen table, and the girls can experiment, try new techniques, and just enjoy the process of creating. It’s a great way to use some of our forgotten materials and tools. This clay is so smooth and fun to work with. Dries great, too. 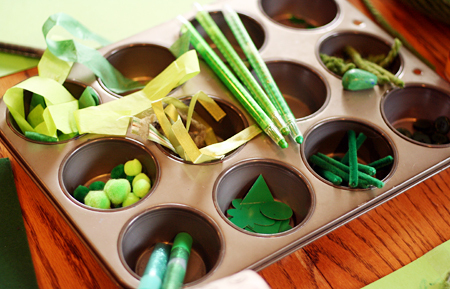 This works with any color – gather up all the arts & crafts materials of your chosen color and set-up a collage buffet! 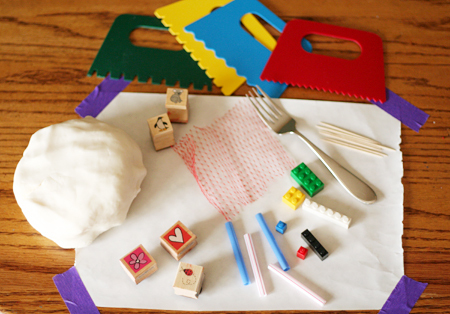 Get those creative minds working with crazy hole-in-the-middle paper. 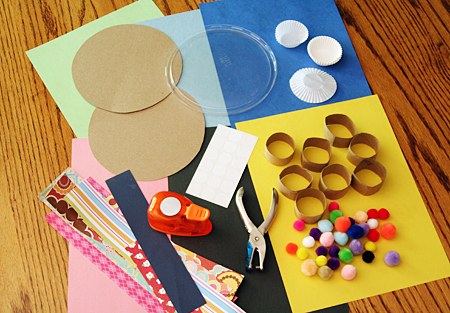 I love searching through all our forgotten craft supplies for theme inspiration – this time, all things round! The girls made some seriously cute creatures with these materials. Probably going to do this one again soon! Oh, I love these ideas! Ever since the kiddos started back in school I haven’t been doing much with the kids art wise for ages and this just inspired me. Magnificently marvelous!!!!!! Free art is one of my very favorite things!!!! Great ideas! Would you happen to know where you got those animal stencils? 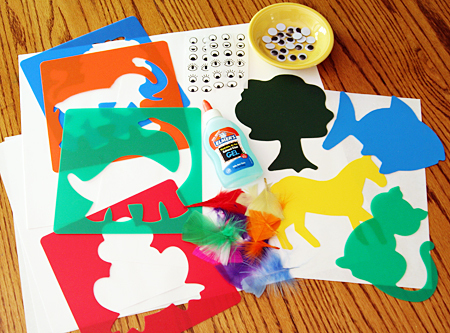 Hi Sarah – I think our animal stencils are from two different sets: Animal Shapes Stencils at Discount School Supply and Child’s First Stencil Set at Blick Art Materials. We love the plastic stencils!